Fikayo Tomori couldn’t hide his disappointment after Derby County’s 2-0 defeat at Blackburn Rovers on Tuesday night. Rovers struck late with goals from Joe Rothwell and Bradley Dack doing the damage to Derby’s play-off push. 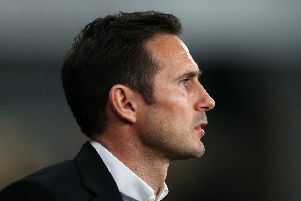 And the centre-back felt that the defeat was made even more disappointing as it followed two positive performances by Derby in their return to action following the international break, which saw them 6-1 victors over Rotherham United and draw 3-3 with Brentford on the road. “Disappointing is the word to use” Tomori told RamsTV. “Everyone is feeling down after the game because we knew it was an important one, especially this week coming off the back of the performances we have had recently since the international break. “They made it difficult for us today, sitting off and the game got a bit bitty and it is always hard to get going when it is like that. The 21-year-old believes that the mid-table placed Rovers worked hard for their victory and created the chances, while the Rams failed to do so. Derby face Bolton at home at the weekend as they look to fight their way back into the top six. “The mentality to just go again is how we have to approach the rest of the season,” he added. “Throughout the whole season when we have had disappointing results we have managed to bounce back so I think we have to have the same attitude for the run-in.